Putnam reliever Austin Keel's only job in the seventh inning Tuesday was to throw strikes. 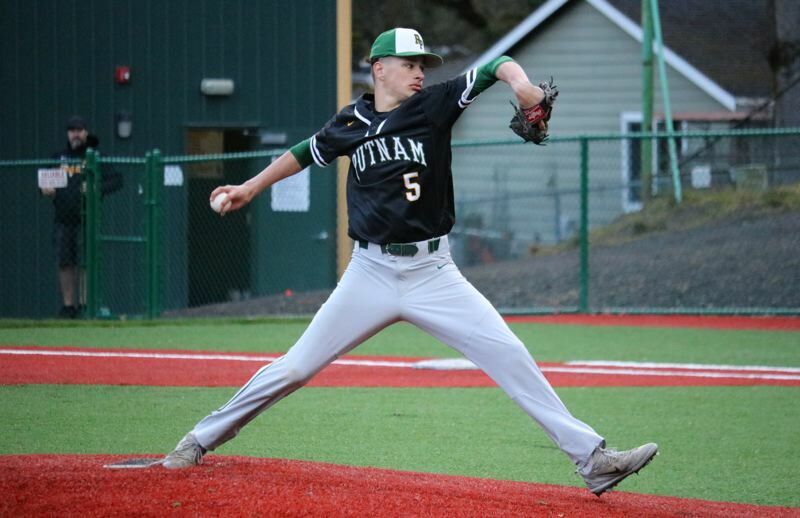 Facing the top of the Scappoose lineup, Keel needed only 10 pitches and one base-running gaffe by the Indians to get through the seventh unscathed as the Kingsmen nailed down a 5-4 Northwest Oregon Conference victory at Rex Putnam High School in Milwaukie. The Kingsmen (9-3, 4-0 NWOC) scored one run in the first inning, two in the second, and two in the fourth to take a 5-2 lead, and then held on after that to run their longest winning streak of the season to five games. "It wasn't our best effort, but it was good that we came out on top," Kingsmen coach Chad McGowan said. "We did just enough in the right spots to get the win." Putnam starter Nick Geertsen pitched the first six innings, allowing four runs on seven hits with two walks and eight strikeouts before the turning the ball over to Keel, the sophomore right-hander, to start the seventh. "Keel is a guy that throws strikes for us and he's a guy that I'm trying to get on the hill a lot more," McGowan said. "Our starters have been pretty dialed in for most of the year, so he hasn't gotten a tone or work. "It was good to get him into a pressure situation to see what he has. The Scappoose dugout was trying to rattle him a little bit, so for a sophomore to come in, tune them out a little bit, and throw some strikes was good to see." What was going through Keel's head as he took the mound for the first time since his March 25 start against Sandy? "Just get work done — throw strikes, let the defense do the work, and hope we'd win the game," Keel said. "I threw a cutter, fastball, and a curveball. The curveball wasn't working too well, but the two-seam fastball felt good." Scappoose's Mike Reed led off the seventh and reached safely after chopping a 2-2 pitch from Keel to the left side of the infield that Kingsmen third baseman Tanner Drog struggled to handle cleanly. Quincy Cleveland came to the plate looking to bunt, but pulled off the first pitch from Keel as Reed took two steps toward second. Putnam catcher K.J. Ruffo threw behind Reed, who slipped as he tried to retreat to first and then got tagged out in a 2-3-6-4 rundown. Cleveland then got under a fastball from Keel and hit a fly out to left, and then Breeler Mann stepped up and did the same — fastball, fly out to left, game over. "We could have won the game if we'd cleaned up some things … things that we can control that can make us better," Webb said. "We just talked to the players about controlling our emotions during the game and that we shouldn't have to wait for things to go our way to put up a fight. "And the best news is that we have another chance to come back at them tomorrow." Scappoose (1-8, 0-1) took a 2-0 lead in the first inning when Mann reached on a two-out single, Terrence Lewis followed with a double to right, and both runners scored on an error. Putnam got a run back in the first after Drog got hit by a pitch from Indians starter Liam McMullen and came around to score on John Foglio's infield single to make it 2-1. In the second inning, the Kingsmen turned two walks, a passed ball, a sacrifice fly, and an RBI ground out into two runs to take a 3-2 lead. Putnam added two more runs in the fourth when Ruffo scored from second on an RBI-single by Geertsen, and then Geertsen came home on a sacrifice fly by Vincent Salvione, pushing the lead to 5-2. Scappoose rallied in the sixth when Lewis led off with a double to right and Gavin Larson followed with an RBI-double to the gap in left-center. Larson then advanced to third on Ben Anicker's ground out to second and scored when Jordan Buchanan drove a 1-1 pitch from Geertsen to the fence in left, pulling the Indians within a run, 5-4. Geertsen got out of the inning when he retired Logan Travis on a bouncer back to the mound and then got Tyler Souvenir to ground out to third. "I love seeing the fight from our guys to come back at the end," Webb said. "It's just frustrating to not see them come out on top because I know how hard they work and I wanted it for them. "I like our chances playing these guys again. Luckily, every day is a new day, and there's a lot of games in baseball."